One of my younger sisters is celebrating her birthday tomorrow (number twenty-six!) and I wanted to share the somewhat-simple gift I put together for her. One of the (only) perks of living far away from family is having the excuse to send birthday boxes in the mail. As I mentioned before, this year my goal has been to remember birthdays better than I have in the past, and I was actually ahead of the game getting this sister's package in the mail in time for her birthday. Hurrah! I wanted to paint the hoop gold and was absolutely surprised to come across some gold paint in one of my random supply boxes. (Which proves it's a good thing to hoard craft supplies that you someday forget about.) 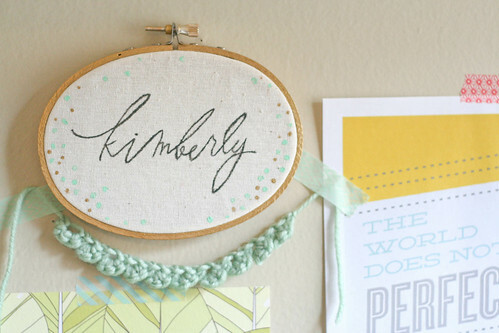 As far as the calligraphy is concerned, I turned to good ol' Pinterest and searched for lettering that I liked. I managed to come across the work of oh my deer (gorgeous website, by the way!) 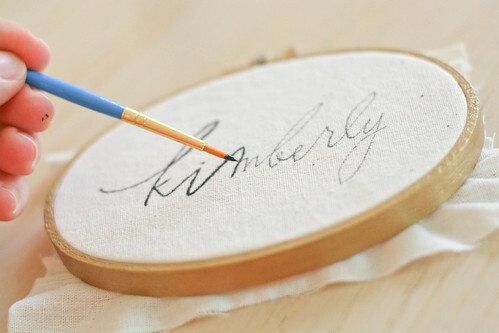 and she had actually done some work with the name Kimberly. Fate, right? Right. 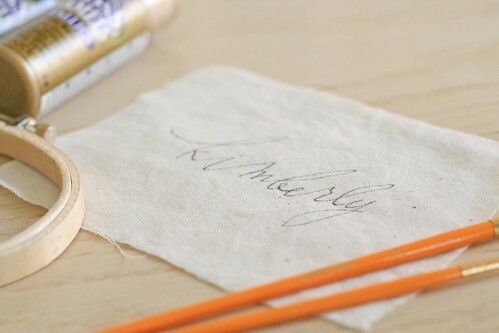 I taped a small rectangle of cotton muslin to my computer screen (I used washi tape so it came off easily) and traced the name lightly with a black pen. Pretty! 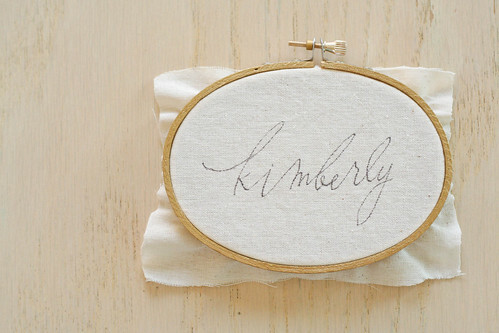 It makes me want to become better with my own fancy-shmancy lettering so I could do something like this freehand. I gave the hoop two coats of gold paint, which was very quick and easy. 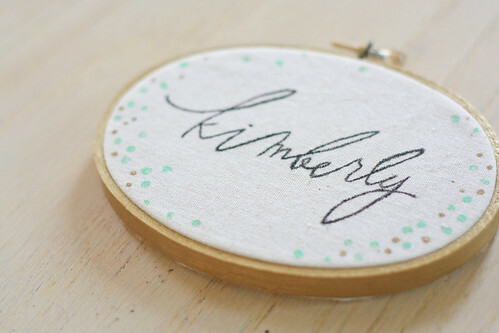 It took me a while to get the name positioned in the hoop the way I wanted, but I finally got it right. Painting over the letters turned out to be way more difficult than I thought. In hindsight, I'm not sure it's even necessary to paint over the writing—I feel like it could very easily have the same effect if you just used a dark marker that didn't bleed into the fabric. But, alas! I worked those fine motor skills and painted over the letters with one coat of black paint (using the tiniest brush I could find). After finishing the letters, I decided it was still too plain without some extra bit of color. I dipped the handle end of my small paintbrush in some minty and gold paint and added dots around the edges of the fabric. 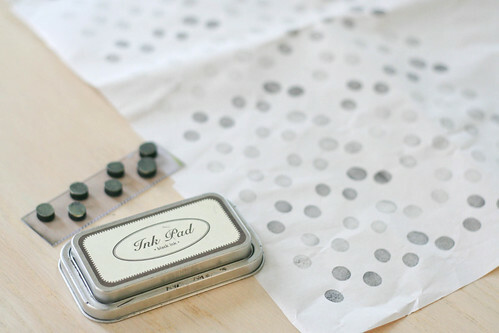 To wrap the gift, I stamped some dots with black ink onto butcher paper. I love when cashiers wrap things I buy in this stuff—usually at Michaels or the dollar store. I always keep it and use it for wrapping paper. So easy! This is just too cute. 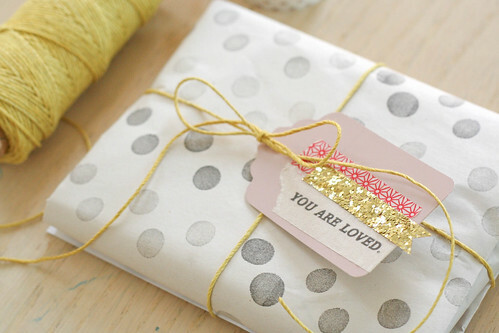 Love the idea and the gift wrapping. Handmade is always the best! Thanks for sharing your clever ideas with us! That's such a cute gift! It's so unique and creative. This is adorable! I wish I had 1 ounce of the crafty craftiness you have! 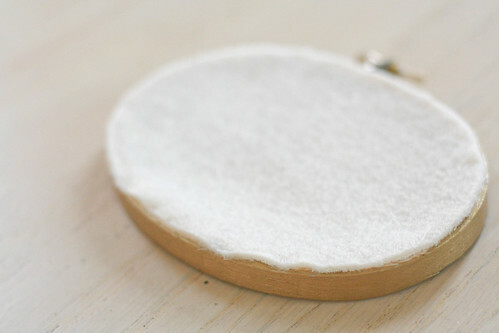 I've always wondered how people finishes their hoop crafts (is that even a thing?). Now I know. Thank you so much for sharing. I wish I had your crafting talent! Gorgeous! I love this! You have such an eye for making simple things incredibly beautiful. I really love this! 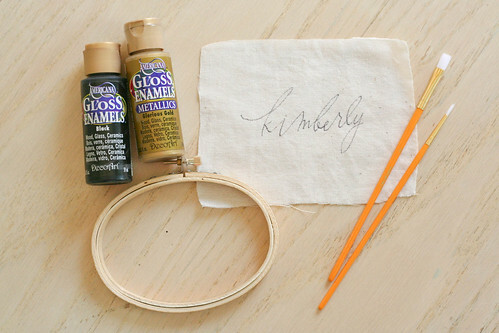 Keeping butcher paper is such a fabulous idea, I would've never thought of it. 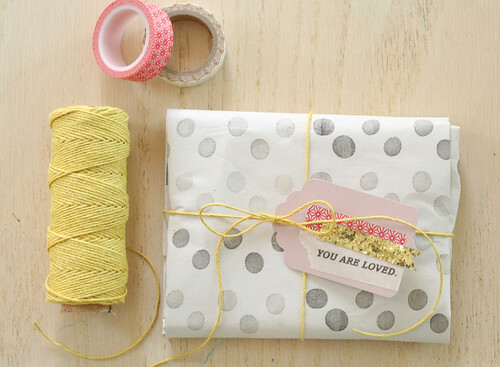 love your DIY packaging!!! And that hoop art is pretty cute too!! Trying to hold back to buy some of that tape when I come visit the Oh Hello Friend shop in May!! !